When I saw the recipe for Fusilli with Caramelized Spring Onions and White Wine sitting in my “Recipes to Make” folder (an actual folder, mind you, not one on the computer–I am old school like that), I thought I’d add it to my meal plan because I had everything on hand for it except the onions. When I went to write up my meal plan post, I noticed that the recipe had pretty mediocre reviews online, with readers commenting that the dish was bland and flavorless. Oh, what to do! I had already done my shopping for the week, so it was too late to make something else. Instead, I decided to change the recipe–I added everything I could find in the pantry to give this pasta dish a big boost in flavor. I could have gone the easy route and doused this with massive amounts of cheese, but I opted to add ingredients that pack a lot of flavor into a small amount of calories and fat, making this Mediterranean-Style Rotini recipe both delicious and healthy. A filling-yet-light Mediterranean-inspired pasta dish adapted from Cooking Light’s Fusilli with Caramelized Spring Onions and White Wine. Combine panko, 1 tablespoon oil, 1 teaspoon garlic, and a dash of salt in a small bowl. Spread panko mixture in a single layer on a baking sheet. Bake at 375 degrees for 6 minutes or until golden brown, stirring after 3 minutes. Cool. Heat a large skillet over medium-low heat. Add remaining 1 tablespoon of oil to pan. Add onions to pan; cook 20 minutes or until golden brown, stirring occasionally. Add remaining garlic and wine. Increase heat to medium-high; cook 1 minute. Add broth and heat until liquid is reduced (about 4 minutes). Remove from heat; stir in olives, artichoke hearts, basil leaves, and sun-dried tomatoes. While onions are cooking, cook pasta in boiling water according to package directions. Drain. Stir pasta into vegetable mixture and add remaining salt and pepper. Divide pasta mixture into bowls; sprinkle each serving with 2 tablespoons of the panko mixture. That’s the most appetizing recipe I’ve seen all week! Plus it’s National Noodle Day today! I swear, there’s a day for everything now! Yum – I love anything with artichokes and olives!! This sounds like perfection! I’m making this on Monday one week but I have to add some feta cheese to it! Feta would definitely go well in this! It was so tempting, but I’m trying really hard not to eat as much dairy. But cheese really does make everything taste better. Delish! I’ll be making this one, too. But omitting the olives and adding spinach! Omitting the olives? For shame! Love it! I have a folder, too, a plastic one where I keep recipes I’ve ripped out of magazines that are waiting to be made 🙂 I’ll be trying this one! Looks wonderful! This looks so flavorful and fantastic! I’d love to try it the next time we’re feeling adventurous – we don’t eat Mediterranean meals very often, but this one makes me want to change that! Thanks! We don’t eat Mediterranean much either, so this recipe was a nice change of pace. I hope you like it if you make it! You make the best sounding recipes. Makes me hungry to read them. 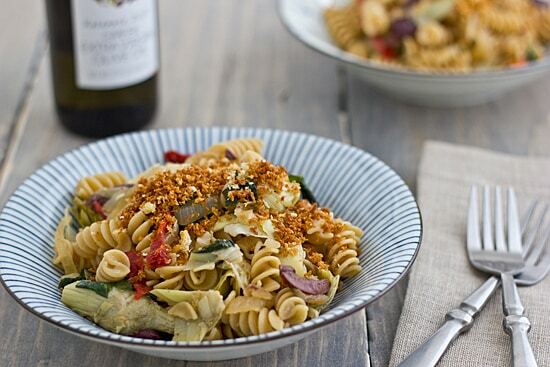 Sounds delicious – both the home sun dried tomatoes and the Rotini dish. Must try both!